Sigmund Frog is a school counselor at Patton Elementary school in Austin, Texas. Unlike most school counselors, Sigmund works for a rather unusual pay scale — belly rubs and cookies. 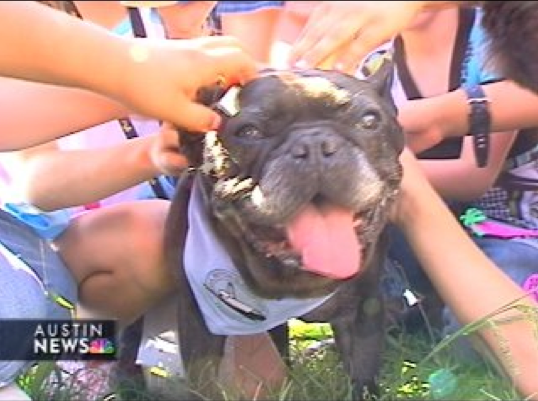 Sigmund – better known as ‘Sig’ – is a brindle French Bulldog belonging to school counselor Kathy Moore. Moore discovered that kids related to her better when she brought Sig along to counseling sessions, and he’s been accompanying her to school ever since. Now, it would be unthinkable for kids to not see Sig along side Linda. In fact, some of them feel he’s a bigger part of their counseling than Moore is. “The dog makes us happy because it, like, snuggles with us,” Spencer says. “Good boy, Siggie,” says a student. “Sig especially has a way of knowing when a child is really in need, and he will zero in on them,” Moore continues. “It gives the kids a stake in Sigmund getting well,” Moore says. “I didn’t realize how important it was for them to feel like they were helping him,” Moore says. It’s now four months later, and the kids at Patton Elementary are back at school – and so is Sigmund, his cancer almost beaten, and his chemo treatments almost over. A summer long chemotherapy program helped, but Sig’s liver reacted poorly to the drugs. So, doctors tried again with a new chemo regimen and the dog responded well. There are still a couple of sessions left, but things are looking up, and Sig’s counseling appointment book is filling up. Read the full second story here. The students at Patton have their counselor back — and best of all, they have Sig’s shoulder to cry on, and his ear to whisper in. His first client of the new school year is a child named Destiny. Destiny Arriaga made her way to the counselor’s office with the aid of a cane. She is blind, and though children at Patton are supportive and helpful, making one’s way in a school full of sighted kids has its pitfalls. So, Destiny has regular visits with Moore, and more to the point, with Sig. Moore watches child and dog delight in each other. 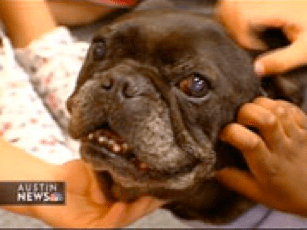 Here are the two KXAN videos of Sig’s story — the first from May, and the second just released. After the jump, as the videos start playing automatically. Thank you so much for sharing. Sigmund Frog is such a cutie — hope he’s well on the road to recovery.